The intelligentsia mocked her writings and lampooned her philosophy, which she called Objectivism. But Ayn Rand's books, especially her two major works The Fountainhead and Atlas Shrugged, continue to sell millions of copies. There are Ayn Rand think tanks, academies, even dating sites. And her influence on politics and popular culture is stronger than ever. Contributor Sandy Bourque outlines Rand's improbable rise to fame and influence, and the surprising Canadian connection, which helped secure her place in the history of ideas. **This episode originally aired November 1, 2018. 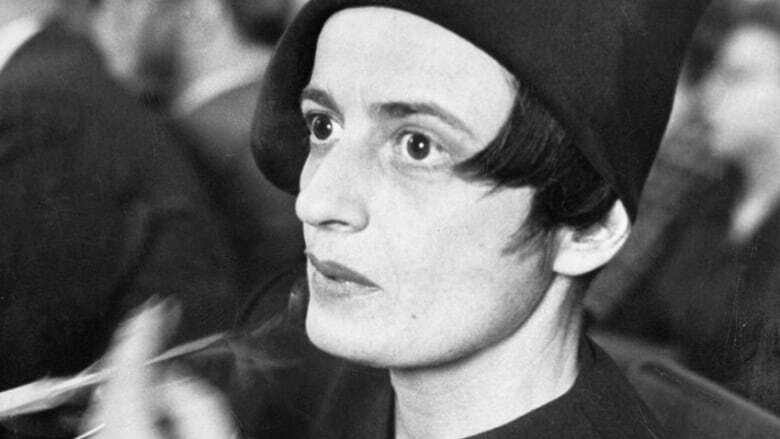 Ayn Rand was one of the most controversial and influential American writers of the 20th century. Most of her fans will tell you they discovered her books on their own. And that reading The Fountainhead or Atlas Shrugged changed their lives. More than 36 years after her death, Rand's other books — including her lesser-known works like We The Living, Anthem and The Virtue of Selfishness, which are still in print — have also stood the test of time and continue to sell hundreds of thousands of copies every year. Her books have become underground "must-reads." "I think I had that typical American experience of being a teenager and having someone give me the book and say, 'You have to read this book.' 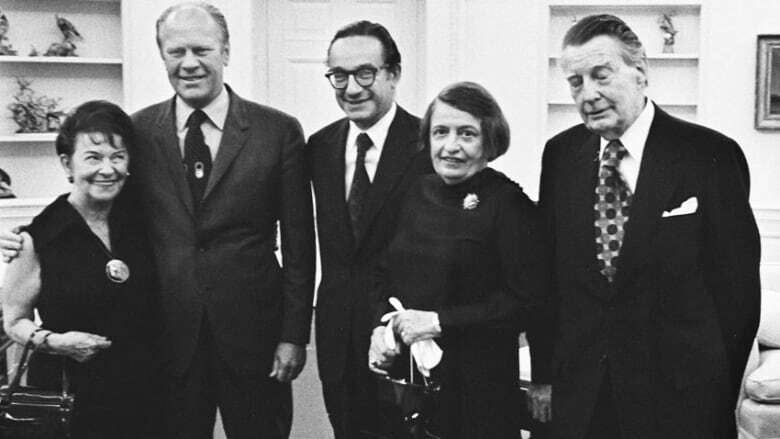 In this case, it was The Fountainhead, and that's one of the interesting things about Ayn Rand: she, for most of her career, did not come from professors or teachers, she came from peers and she was almost like an underground sensation." Rand didn't like the heroes she saw in American movies and fiction when she left her native St. Petersburg in the 1920s. There was too much collectivist thinking, she believed, and collectivism was the fuel behind the communist atrocities that she and her family had lived through. So she created her own heroes, like Howard Roark, entrepreneurs who pursue their vision of themselves. She prized individualism above all else and saw those who tried to crush the spirit of individualism as evil and immoral. As a young woman, Rand's father's shop was appropriated by the Russian state, and she fled the horrors of the revolution to go to America. After arriving in New York, she headed straight to Hollywood. She'd fallen in love with American cinema, and cherished its imagining of the American dream. Although she arrived with little money and a poor command of English, Rand would soon become a Hollywood screenwriter and would live the life she'd always dreamed of: marrying a Hollywood actor and writing screenplays. When the Great Depression hit and Americans started looking at communism as a possible alternative, Rand was so horrified that she decided to dedicate the rest of her life defending capitalism and the rights of the individual. So she set her screenplays and novels in a dysfunctional, violent Russia. She was trying to warn America about the evils of collectivist thinking. In the beginning of Rand's publishing life, intellectuals and literary critics rejected her work because they thought she was simply wrong about communism. It didn't help that Rand also made her characters too extreme for the American public's taste, at least at the beginning of her career. But film adaptations of her work may have helped her. "You're dealing with the character who is the strong silent type, which goes over very well with audiences. And he has a real strength of character. And the people who are acting against him — the antagonists in the novel — are particularly a slimy group of people. They have no integrity. So therefore the reader gets the sense that integrity equals individuality. It doesn't matter how extreme the individuality is, it seems to be OK because of the character of Howard Roark, the hero of the novel." It's difficult now to realize how great the odds were against Rand in the 1940s. She was foreign-born, a woman, and in an era long before the birth control pill or the feminist movement, she was trying to become a public intellectual. Sheer determination alone wouldn't get her to where she wanted to go. She needed allies. And she found them in a small group of ultra-committed Canadians. Rand's ideas would likely have slipped into obscurity had she not met one young Canadian in particular. Nathaniel Branden would become her closest friend and eventually her lover for almost 20 years. Branden introduced Rand to his friends and relatives, all whom were Canadian, except a young Alan Greenspan, the future Chairman of the Federal Reserve. Branden would help Rand through the final push to finish Atlas Shrugged and to help her develop and spread the philosophy they'd later call Objectivism, which continues to grow in popularity around the world. Jennifer Burns is an associate professor of history at Stanford University and author of Goddess of the Market: Ayn Rand and The American Right. Gary Weiss is an investigative journalist and author of Ayn Rand Nation: The Hidden Struggle for America's Soul. Goddess of the Market: Ayn Rand and The American Right by Jennifer Burns published by Oxford University Press, 2009. Ayn Rand Nation: The Hidden Struggle for America's Soul by Gary Weiss published by St. Martin's Press, 2012.
Letters of Ayn Rand by Michael C. Berliner published by Dutton, 1995. My Years with Ayn Rand by Nathaniel Brandon published by Wiley, 1999. Interview on Reason TV with Nathaniel Branden on "My Years With Ayn Rand"
**This episode was produced by Sandy Bourque and Greg Kelly.